Please join us in Washington, DC on Friday, December 31, 1999 from 10:00 PM to 1:00 AM. A stirring show produced by Quincy Jones and George Stevens, Jr. will build toward an unforgettable Midnight Moment to mark the time we pass into the new century and new millennium. This will be the nation's commemoration of the transition to the new millennium. The audience, expected to number in the hundreds of thousands, will gather on the National Mall in an historic setting between the great symbols of our Democracy - the Lincoln Memorial, the Washington Monument, the U.S. Capitol, and the White House itself. They will be joined by the President and his honored guests for the transition hour to the year 2000. Great stars of the entertainment world will perform with a 100-piece orchestra, along with the combined bands, choirs, and marching units of the U.S. Armed Forces. 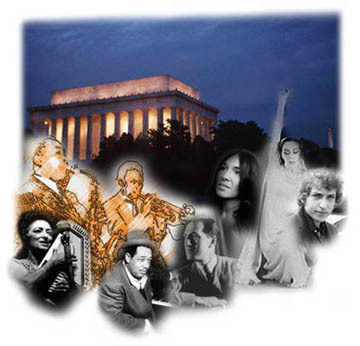 The entertainment will center on the great American music of the century, choreographed to celebrate the ennobling achievements of our country, summing up in song and memory that which has made the United States a great nation.